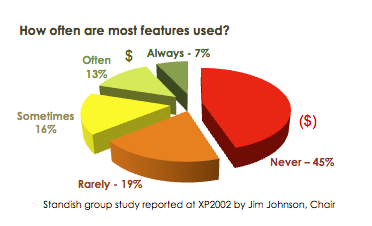 Maybe you have plenty of time and money to spend developing features that don’t add value to your product. Most of our clients don’t. Stare at the chart at the right for a moment. Wouldn’t you want to be pretty sure you’re in the green? Are you in a highly regulated industry where your software requirements are part of your standard operating procedures? Or are you proactively managing an outsourcing effort? Provaré experts can ensure that your requirements are complete, traceable, and testable. That’s easy. More importantly, we’ll help you know that you’re providing measurable value to your customers. * And if you’ll let us help you with agile adoption, we’ll show you how you can stay that way throughout a project. If you want to stop developing for the dustbin, call and let’s see if we can help.